PR folks and journalists don't always get along, but the dance gets ratcheted up in a big way when high paying corporate sponsors are involved. Sponsors that more often than not would like to see their name in press, too. So should sponsor mentions ever be a condition for the press pass? 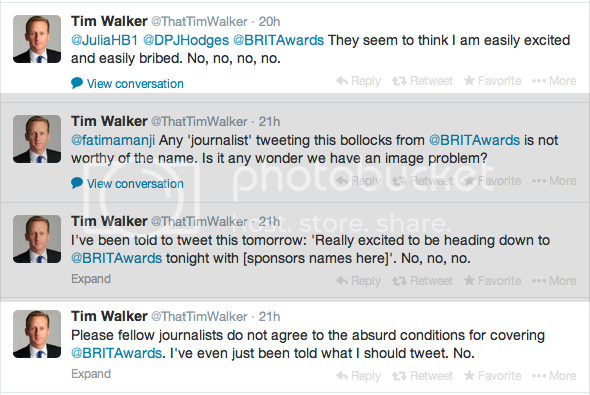 That's the topic Telegraph columnist Tim Walker took on when he was invited (seemingly with strings attached) to tonight's Brit Awards sponsored by MasterCard. The whole bit backfired very publicly as you'll see in a minute. Hope you’ve had a lovely weekend. As you know we’ve been in touch re. accreditation for the BRIT’s but just wanted to check in with you directly to confirm that you are happy with the below. Firstly as part of our Priceless Surprise we are putting on cars to take guests directly to the awards – we will be booking your car to take both yourself and Katy from the office at 4:30pm. Are you happy with these details? Please let us know if you have any further questions and look forward to hearing from you. We have become aware of this situation and have been clear with our agency and attending media. Attendance at the Brits is not, nor has it ever been, a condition of coverage or endorsement. To imply such is highly inappropriate. 1) Next time you're closing your sponsor pitch by highlighting all of the media coverage you'll be getting, you now have a great reason to stop short of any guarantees. 2) Make sure your press team knows, and makes it clear to journalists, that while sponsor mentions are encouraged, they are not conditions for the invite. 3) Even better, offer "priceless" access and experiences to journalists and the sponsor mentions will likely follow. Not only that, but the mentions will be much more authentic than a pre-agreed tweets for tickets trade-off.